Views of Vail slopes, hot bubs, walk to Lionshead Gondola, shops & restaurants. 2 bedroom + loft bedroom/3bathroom. Located in the heart of Lionshead, this spacious and newly remodeled two level condominium has gorgeous views of Vail Mountain. Kitchen just updated with spacious island featuring Cesar Stone counter tops and Mosaic Glass Tile on island and back splash. Entry way and kitchen have Brazilian Gray Slate. Newly remodeled 3 bedroom (2+ loft) condominium within easy walking distance to Lionshead village and Vail Mountain. The kitchen and bathrooms are appointed with granite level finishes and high end cabinetry. This spacious property has wonderful views looking towards Vail Mountain. Guests will enjoy the convenience of covered garage parking (1 car), as well as common area hot tubs, pool (summer only) and common W&D's. 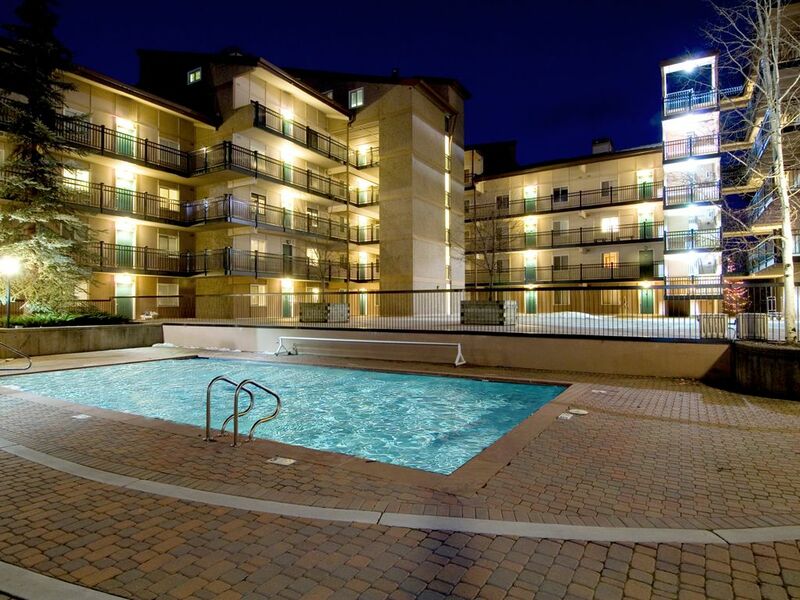 Vantage Point #602 offers all the other conveniences of home including wireless internet, flat screen TV's, gas grill on the balcony and a gas fireplace. It is truly a hidden gem in Lionshead!! 1. We have an online concierge that provides a number of free services if you need any assistance planning your trip (i.e. discounted rental car or transportation, discounts on ski rentals & even delivered groceries). 2. We offer the best priced lift tickets available for Vail/Beaver Creek. Date restrictions apply. 3. The convenience of going directly to the property with codes to let yourself in. 4. Family-owned business with local managers. 5. 24 hour emergency on call service for manager on duty. 6. Free access to the Aria Club & Spa. The location is awesome!! Really nice and convenient to just about everything. There is parking directly under the unit so it is really easy having everything so close. The unit is small but very tasteful! There is an amazing porch which looks out over the gondola and the mountain. The kitchen had everything we needed, but it would probably help to add a few more cooking and serving items. There are 2 hot tubs that are really nice on the property as well. They were well maintained and a nice apres ski option! Only problem we had was that the elevator to the 6th floor was undergoing maintenance for 3 days that we were there. Since that is the only elevator that services the unit we had to go down two flights of stairs and over to the other side of the building to get to and from the unit. Not a huge issue, but it was tough for one of our party who had an injury. All in all we would definitely rent the unit again! Vantage Point is very conveniently located on the back side of Lionshead Village. Quick walk to the gondola, shuttle, and even a market right across the street. Condo is very clean and well appointed. Appliances are high end and work great. The staff are friendly and helpful, and the unit was clean and ready on our arrival. A couple of minor negatives - traffic noise in the bedrooms, and snow/ice on the sixth floor walkway from the elevator that seemed to never go away (falls from the roof above). Overall very happy with the rental and the price was great for the location. Would happily stay here again. Views and proximity to the slopes were fantastic! We loved staying at Vantage point, but wish they had updated the codes in the notebook for the ski lockers. We had to make a few phone calls to get the correct information and open the lockers, but it was just a minor inconvenience. They do need new humidifiers because the two in the master bedroom were completely covered in mold. My husband got the flu and those would have been handy if they had been useable. Overall we loved the condo and would stay there again. Great location in Lionshead. Three bedrooms with three bathrooms makes for a great family rental. The balcony was bigger than expected with a great view. Our family enjoyed our stay in Vail. We loved our large balcony that faced the mountain. The rooms were spacious with lots of storage for clothes. Best of all, the location was perfect. We could easily walk to restaurants, shops and the gondola. The only warning was that there was no AC, which is typically not needed but we were there in July. So we had the fans going at full blast every evening. Definitely recommend this property and would stay there again. We had a grea time! The condo was well stocked, conveniently located and clean. Thanks for a great weekend!